Kicking off a new year of exciting Doctor Who adventures for the Main Range Big Finish has to offer is Devil in the Mist. Written by Cavan Scott it sees the Fifth Doctor, Tegan Turlough and Kamelion stuck in a strange alien landscape, surrounded by strange animals and space hippos! Talk about kicking the new year off with a bang! Yes, you read that right, Kamelion is back! The notorious robotic companion that featured in only two televised adventures, The Kings Demons and Planet of Fire has been given the Big Finish treatment. Out of all the different Doctors that Big Finish has handled since their creation in 1999, the Fifth Doctor’s era has taken the longest to complete. While Nyssa and Turlough were on-board from the beginning, Janet Fielding finally agreed to return as Tegan in Cobwebs and then Matthew Waterhouse in Psychodrome. For a time the whole gang was complete, we’ve had plenty of fantastic trilogies and box sets with those guys but there has always been a strange robotic form who has been content to sit in a TARDIS cupboard and be ignored. Until now. 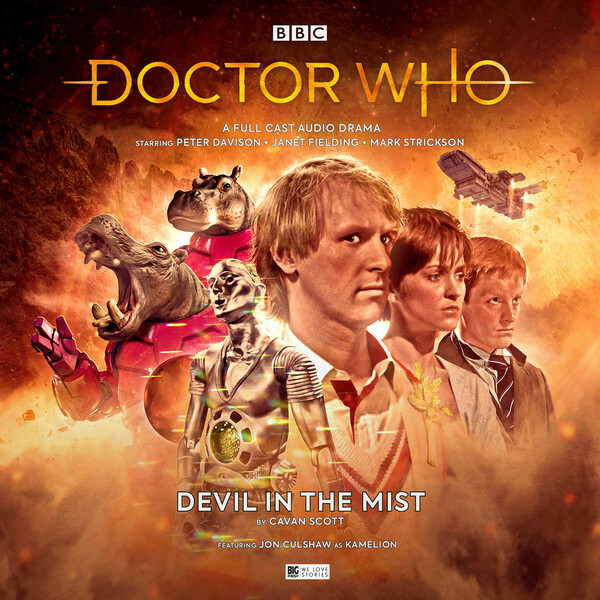 Following a brief appearance in the episode Winter, in the anthology release Circular Time back in 2007, over ten years later, Cavan Scott’s Devil in the Mist, finally gives Kamelion is first proper appearance in the audio format. Cavan Scott has been a busy boy of late, writing for the Star Wars range at Marvel Comics and the Doctor Who series’ at Titan Comics, it is nice to see his name appearing on the Big Finish site once again for the first time since 2017. And Devil in the Mist certainly feels a lot like a comic book adventure, it is one of those stories that would never be produced on television because of budget constraints, even by today’s standards and that is a compliment because it means the finished product feels rather special as a result. We’ve got some truly relentless pacing, which amps up our excitement with the piece, a much larger than life supporting cast and twists and turns thrown at the characters at the end of every episode. To his credit, Scott handles of all this very well, such storytelling might prove problematic for a few other writers who might sacrifice one thing to get more of another. But Scott manages to not do that and all the time, make his supporting characters feel very real. Indeed, I found myself really caring for Orna and Rako, space hippos whose real mission doesn’t become clear until the final episode. It is a fantastic idea, taking something like a hippo and putting them in a spacesuit and they feel a lot like the Judoon, Rhinos in space. But the Judoon are happy enough policing the space-lanes, Orna and Rako work for a species who are glorious warriors, who have now dedicated themselves to peace. Actors, Anjella Mackintosh and John Voce do a terrific job as Orna and Rako and one wouldn’t think for one moment that isn’t anything other than space-hippos! They achieve this by lowering their voices slightly and getting the sound of an animal that would speak with a deeper but louder voice. Their voices also someone manage to convey the weight of these aliens which is something strange to note but it works in their favour too! Where the story stumbles slightly is in its handling of the main villain, Nustanu. While the conclusion explains what has been going on, it is a shame that he hardly features in the story at all, despite the fantastic job that Simon Slater does in portraying the character. Once episode two comes along, the sense of any danger that the opening episode managed to really conjure up, dissipates quite quickly and the dangers that the TARDIS crew encounter feels slightly disjointed as a result. But that is just a minor quibble as Scott gives us some really action-packed set pieces and even puts Peter Davison’s Fifth Doctor through the wringer landing him in a Professor X situation. There is a real sense of panic when we learn that his back is broken, even if the Doctor tries to brush it aside as if its nothing. We know that this won’t stick because there is no mention of anything like this in the television series but Scott does make it an interesting mystery as the story progresses to its conclusion. Let’s take a look at the biggest star of this audio drama, Kamelion, played by Jon Culshaw. Well, he is just a delight! Culshaw does a terrific job in the role, giving us shades of Gerald Flood’s original performance while putting his own spin on the character. As a result, we get a sense that Kamelion is trying to move away from the grip the Master had on him and become his own, well, robot. Scott also gives us hints that Kamelion is trying to form his own conscience and is trying to understand the thoughts and emotions of those around, particularly Tegan who is completely against him joining the TARDIS. Scott gives Kamelion a unique character here, something that was never achieved on television or the novels, The Ultimate Treasure or The Crystal Bucephalus. Hopefully, this will be a narrative trait that will continue through this new Kamelion trilogy and I can’t wait to hear more from him! And let’s give another round of applause to Jon Culshaw who has successfully resurrected this long-ignored character and who finally made him feel like a companion for the Fifth Doctor. Speaking of the Fifth Doctor, Peter Davison is just as excellent as ever. Even if there isn’t too much panic in his voice when the Doctor discovers his back has been broken, it does feel quite natural as the Fifth Doctor would have tried to act gentlemanly despite the dire circumstances he now finds himself in. As well as his excellent chemistry with Mark Strickson as Turlough and Janet Fielding as Tegan, he also has chemistry with Culshaw and as a result, it feels like Kamelion never really did just vanish between his two televised stories. Well done, Mr Davison. Mark Strickson is always a delight as Turlough. Coming after The King’s Demons, this is still fairly early days for Turlough in terms of his televised adventures but with Big Finish we’ve had a whole series of adventures from Cobwebs to The Entropy Plague where Turlough mellowed out a lot more and gelled into the Fifth Doctor dynamic much easier. Strickson rightly keeps that same pace and energy going, deciding not to go back to that slightly duplicitous character he always had on screen. 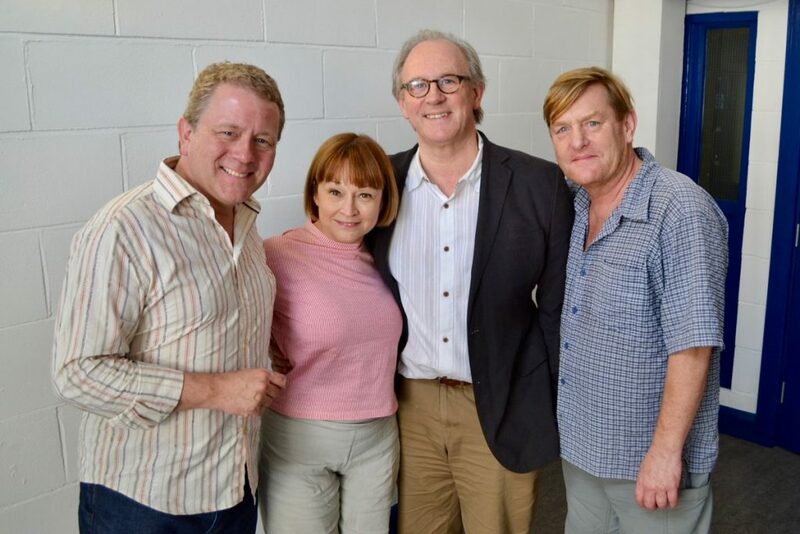 Turlough is one of those companions who has benefited from much character development with Big Finish and in stories like it shows, he is just a joy to be around and some of his sarcastic one-liners end up as comedy gold! Like Turlough, Tegan is one of the companions that Big Finish have really run with her independence shines through here as she basically takes charge of the situation. Her relationship with Kamelion was quite interesting at the end of The King’s Demons and her sense of distrust continues here, even playing into the big twist at the end. We get moments where Tegan is happy enough to let Kamelion help out and then moments when she goes back to distrusting him, even if Kamelion doesn’t understand why. But it feels perfectly natural, in the story that came before, Kamelion gave her no reason to trust him but here, she begrudgingly comes to respect him. It is nice to hear and I’ll look forward to learning if that newfound respect for the new travelling companion continues in future releases. Overall then, Devil in the Mist is a cracking adventure. While there are a few hiccups here and there, the overall story more than makes up for them. It follows an action-packed storyline that never lets up or slips in its pacing and as a result, we are on the edge of our seats. Hopefully, Cavan Scott will be back soon with more stories and not let two years slip past before submitting another story! Director, Ken Bentley does another terrific job here too, keeping the whole cast quite small really helps the story as sometimes a story can have too many characters for its own good. Rightly so, the cast of characters is kept quite small here and Bentley has cast perfectly the guest characters. He also helps the pace keep up while allowing things to breathe in quieter moments. Bentley is one of Big Finish’s strongest directors and long may his work with them continue! The main TARDIS team are fantastic and listening to the interviews at the end of the release, it is clear how quickly and readily they included Jon Culshaw into their little family. The gang feel like they have been together for a long time already and hopefully, this will be a sense that continues for as long as Big Finish keeps these guys together. And the cover from Will Brooks is just beautiful!